It could be argued that Northwest Florida itself is a hidden gem, given that so many snowbirds head further south on the Florida peninsula and have never explored the Panhandle. But for Canadian snowbirds who call the Florida “panhandle” home in the winter, the area has much to offer the visitor including many little-known beaches and attractions and a big dose of Southern charm. The area stretches from the State capital, Tallahassee in the East all the way across to Pensacola in the Western part of the state near the Alabama border and Mobil. It has long expanses of white sand beaches along the Gulf of Mexico and many affordable snowbird accommodations in the general area. It is also a popular RV destination. If you’re a snowbird whose interested in exploring the Florida Panhandle while you’re spending the winter down south, here’s a handy guide to get you started. St. Andrews State Park, ranked number two on the list of “Top 10 Beaches in the United States” by Trip Advisor®, is one of the most popular outdoor recreation spots in Florida. You can hike the Blue Heron Trail that wind through freshwater and saltwater marshes teeming with birds and wildlife. The Gator Lake Trail provides visitors with an elevated vantage point for spotting alligators and a variety of waterfowl, wading birds and other small animals. Button Bush Marsh is a favorite feeding place for a variety of birds including herons and ibis. The park also has over a mile of beach on the Gulf of Mexico and the Grand Lagoon, where you can swim, dive, snorkel and find fishing piers and surf fishing. The park offers RV and tent camping spaces. Camp Helen State Park is bordered by the Gulf of Mexico and Lake Powell – one of the largest coastal dune lakes in Florida. The eco experience includes coastal dunes and salt marshes along the Gulf and freshwater wetlands and sand pine scrub along the lake. Activities include swimming, beachcombing, nature study, hiking, and both freshwater and saltwater fishing. Eden Gardens State Park is home to the Wesley House, a turn of the century Southern home with stately columns and a wrap-around porch set amidst grand old oaks and manicured gardens. Inside, you’ll find a surprising collection of Louis XVI furniture. Located in Tallahassee, the Mission San Luis dates back to 1656 when Spain wanted to establish a capital for its settlements in Florida. The mission served as a religious, as well as military and educational facility for the Apalachee, converting them to Christianity. The Mission was destroyed in the early 1700’s before the British arrived but is today an archaeological and historic site. The Panhandle Pioneer Settlement is a-history museum in Blountstown, Florida that features 18 historical buildings dating from 1820 to the 1940s. The 5-acre settlement allows visitors to see how the early settlers of this part of Florida used to live. The buildings were moved here from throughout Calhoun County. There are many events and festivals held here as well as classes on how to do things the way the settlers did. Don’t miss taking a tour of the underground dry caverns in Marianna, the only place in Florida you can do this! The tour consists of a 45-minute walk through formations that are about 38 million years old. Incredible stalagmites, stalactites, rimstone pools and soda straws are all on view. You can also explore the Bluff Trail and see limestone karst formations and some above ground caves. The Camp Gordon Johnston Museum in Carrabelle tells the story of soldiers who completed their amphibious training here, including D-Day veterans. The town has an annual Riverfront Festival to celebrate is maritime identity, and don’t miss the Crooked River Lighthouse, built in 1895. The Constitution Convention Museum in Port St. Joe is focused on Florida's first constitution, drafted in the town of St. Joseph. The town which was a thriving center and port in 1835 when it was chosen over Tallahassee to host Florida's first State Constitution Convention. The museum tells the story of 56 territorial delegates who drafted Florida's first constitution in 1838. You can take a self-guided tour and see an animated debate of the delegates. Destin was once a small fishing village that has grown to become a major tourist destination with miles of sandy beaches where seafood and fishing are still very popular. The town is also home to the Silver Sands Premium Outlets, which claims to be the largest designer outlet centre in the U.S. Believe it or not, Fort Walton Beach celebrates Mardi Gras every year! 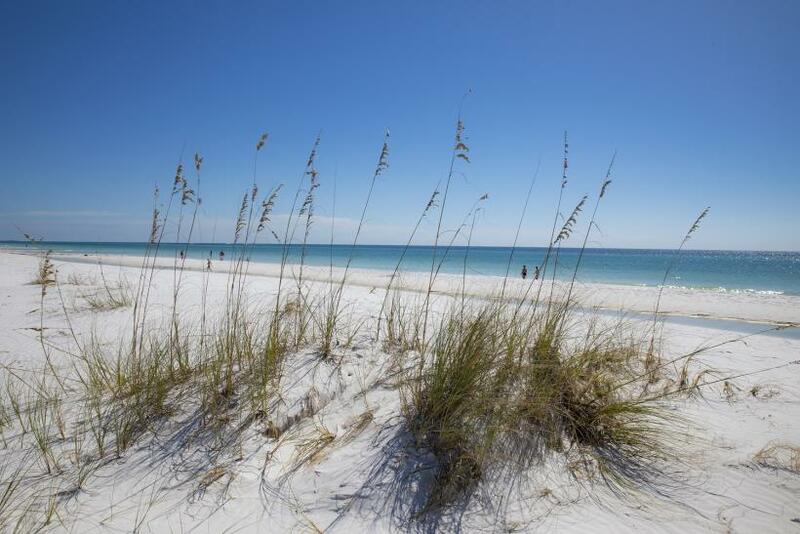 Fort Walton Beach is a popular area with several attractions to keep visitors busy including the Boardwalk on nearby Okaloosa Island and Florida’s Gulfarium, where you can see dolphins and sea lions perform, as well as many other species in the large aquarium. History buffs will enjoy the Indian Temple Mound Museum downtown and the Eglin Air Force Base’s Air Force Armament Museum which houses vintage aircraft. Surprisingly rich in history, it is worth taking a guided tour of old Pensacola. See the 19th-century homes and the 1832 Old Christ Church at Historic Pensacola Village, as well as the old wooden gazebo at Seville Square. The Old Spanish Trail, created in 1929, enabled travellers to go from San Diego on the Pacific to St. Augustine Florida on the Atlantic by linking various towns and cities including Crestview. Main Street, Crestview is the site of many events throughout the year. The Carver-Hill Museum explains the history of the local African-American community. Railroad fans will love this little gem. The Museum is located in Milton, Florida and occupies the L&N Milton combination freight and passenger depot that was built in 1907-09 on the site of the original 1882 P&A depot. The station was bought by the Santa Rosa Historical Society. The museum displays an impressive collection of railway cars and houses a wide variety of memorabilia from the L&N, Frisco, and other railroads.